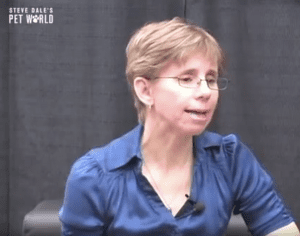 Dr. Susan Little is inspiring – there’s no other way to put it. 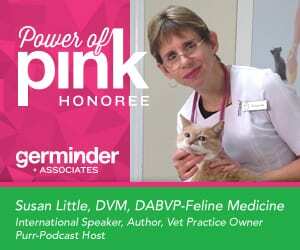 Dr. Little is the most recent recipient of the Germinder20 Power of Pink Award. When our, then famous, piano playing cat Ricky succumbed to feline hypertrophic cardiomyopathy (HCM), I wanted to launch a fund to support research for this very common and deadly heart disease. The Winn Feline Foundation was the first organization to get back to me, and hence the Ricky Fund began. Dr. Little was then on the Winn Feline Board of Directors, and soon became the organization’s Board President. At that time, she enlisted me to join the Winn Feline Foundation Board of Directors, where I continue to this day. I think it’s fair to suggest that we quickly became good friends. 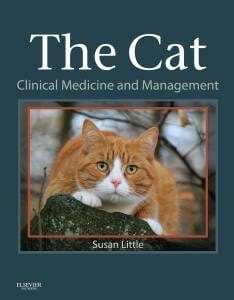 I watched as Susan Little became a world traveling leader in veterinary medicine, and the editor of the veterinary feline textbook The Cat – Clinical Medicine and Management. I probably have interviewed Dr. Little 50 times or even far more. This is from a video interview. Some of Dr. Little’s numerous accolades are listed below in the press release. Far more important is what she has taught me, about cats and cat health, and about ultimate professionalism. Her knowledge of cats is only superseded by her life skills. I have ultimate and unconditional absolute admiration for Dr. Little. Little received her BSc from Dalhousie University (Nova Scotia, Canada) and her DVM from the Ontario Veterinary College, University of Guelph. She has been in feline practice since 1990 and achieved board certification in Feline Practice in 1997. 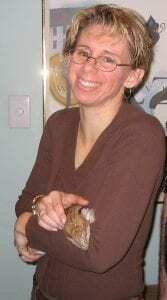 She is part owner of two feline specialty practices in Ottawa, Canada. She is a past president of the American Assoc. of Feline Practitioners and the Winn Feline Foundation. She is currently an International Council for Veterinary Assessments board member. She is a peer reviewer for veterinary journals as well as the author of many journal articles. Dr. Little’s travel has taken her all over the world, but her first lecture stop for 2019 will be VMX, Orlando, Florida, January 22 and 23. Then it’s on to Western Veterinary Conference, Las Vegas for a one half-day wet lab. After that lectures at the International Society of Feline Medicine (ISFM) April 3 in Birmingham, England. To keep up with Little, follow her on Twitter @catvetsusan or on Instagram @catvetsusan. Little is the recipient of the Canadian Veterinary Medical Assoc. Small Animal Practitioner Award (2010), the NAVC Small Animal Speaker of the Year Award (2013), and the International Society of Feline Medicine/Hill’s Pet Nutrition Award for outstanding contributions to feline medicine (2013). She is the editor and co-author of two textbooks: The Cat – Clinical Medicine and Management (2012) and August’s Consultations in Feline Internal Medicine, Volume 7 (2015). #Germinder20 #PowerofPinkHonorees named and donations given to date include: Debra Horwitz, DVM, DACVB(donation to: Missouri Humane Society), Heidi Lobprise, DVM, DAVDS (donation to: Lutheran Church Charities K-9 Comfort Dogs), Elizabeth Colleran, DVM, MS, DABVP (donation to: Winn Feline Foundation), Dan Richardson, DVM, DACVS (donation to: Stormont-Vail Foundation Care Line), Manolita Moore (donation to: The Pixel Fund), Jen Reeder (donation to: Green Dogs Unleashed) Mary Beth Leininger, DVM (donation to: Purdue University College of Veterinary Medicine Scholarship Fund), Guy Pidgeon, DVM, DACVIM (donation to: Colorado State College of Veterinary Medicine Scholarship Fund), Megan Peters (donation to: KC Pet Project), Julie Lux (donation to: the American Beagle Rescue Network and the Dalmation Club of America Foundation), Amy Shojai (donation to: Cat Writers’ Association), Norita Taylor (donation to: Band of Angels), Lane Odle (donation to: Sunshine House), and Arne Zislin, DVM, VMD (donation to: International and Immigrant Student Services (IISS) at Johnson County Community College (JCCC). Links to personal interviews with these Honorees are featured here. #Germinder20 #ThePowerofPink was announced in January 2018 as part of the celebration of Germinder’s 20thAnniversary. The storytelling initiative highlights the founder’s story of breast cancer survivorship and also shines a spotlight on leaders whose stories have touched and inspired Germinder to success. Initial donations were made in honor of Rache Simmons, MD to The Weill Cornell Breast Center at the Weill Cornell Medical College/New York Presbyterian Hospital, an integrated, multi-disciplinary care center where Germinder was successfully treated for breast cancer six years ago. Another recipient is the Clara Goy Foundation in memory of Germinder’s brother-in-law, Gene Melleno, a girl’s high school basketball coach who passed away Jan. 1, 2018. Other donations have been made to the Jan Hus Community Outreach Program in honor of Germinder’s immigrant great-grandmother Marie Therese Kacin and to the News Literacy Project. The final Honoree list and donations made in 2018 will be announced by January 31, 2019.